Cufflinks have existed since the 17th century and have changed over the years. Passing through the hands of luxury jewelry designers, they have become fashion accessories. Today, there are many unique cufflinks made of original and rare materials like palladium. 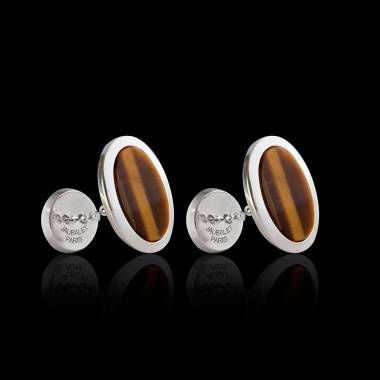 Cuff links appeared in the 17th century. Until then, men used ribbons or lace to elegantly fasten their shirtsleeves. 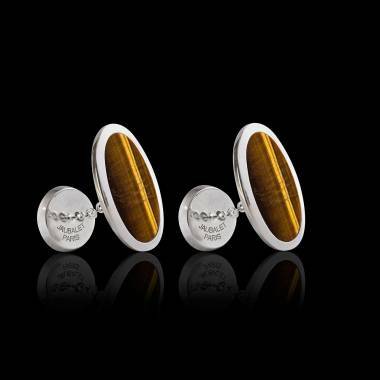 The first cufflinks were made of two gold or silver buttons connected by a small chain. They were generally worn with mousquetaire shirtsleeves which were double faced sleeves folded over and rather stiff which made fastening them with a simple button quite difficult. 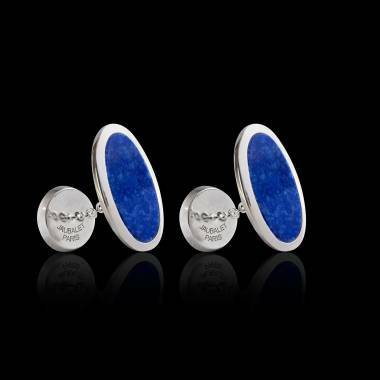 From the 17th to the 19th centuries, cufflinks were only worn by the elite. 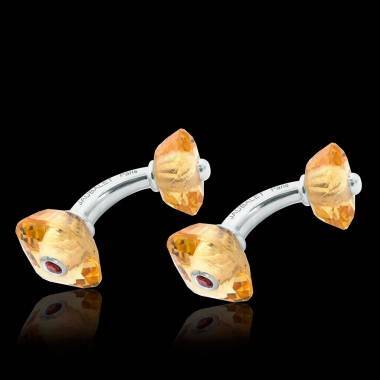 They were costly and considered jewelry to be worn on special occasions or professionally. 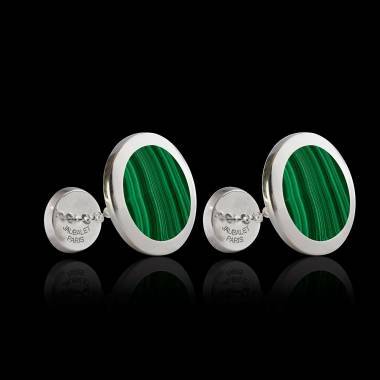 At that time, King Edward VII started an infatuation for cufflinks set with precious gemstones. It was only in the 20th century that cufflinks became more accessible. 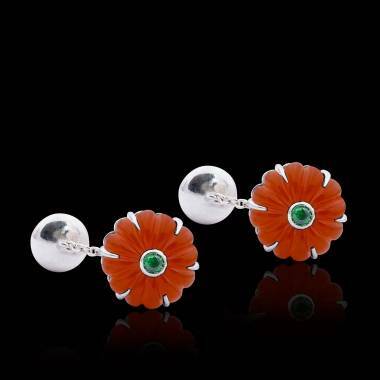 Well-known luxury fashion houses and jewelry designers created new more modern models. From that time on, cufflinks became an indispensable accessory that all men should have, and consequently they could be found in a wide range of prices starting at as little as 15 euros going as high as thousands of euros for the most luxurious ones and those made of various precious metals or original ones such as Palladium. 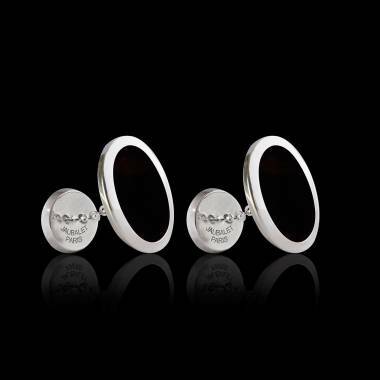 Silver cufflinks are well known and well liked. 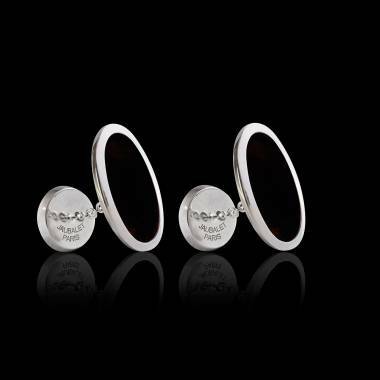 Silver has been used to produce jewelry and coins since 2500 years BC and constitutes a sure thing for all men. Nevertheless, in the age of originality and innovation, jewelry designers are on the look out for new more resistant and durable precious metals for their creations. 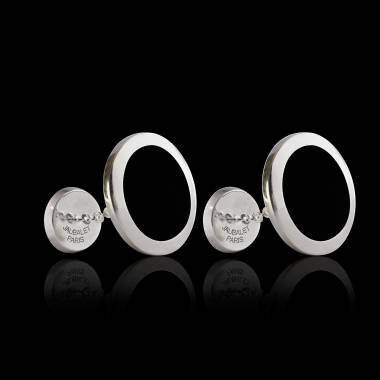 Pure silver is a very malleable precious metal but soft and oxidizable. It therefore needs to be alloyed with other metals to obtain high quality jewelry. This is where palladium comes in. This metal from the platinum family is very rare and is exceptionally wear resistant and, paradoxically, surprisingly lightweight. It is naturally white with a beautiful everlasting sparkle and a structure that is close to silver. A silver and palladium alloy makes it possible to obtain lightweight cufflinks that don’t oxidize and whose color and sparkle will last a long time. Silver has always been associated with peace and harmony. In Mythology, its sparkle is compared to that of the moon. Egyptians adored it for its purity and considered it as precious as gold. In Antique Greece, silver with its bactericide and germicide virtues was used to fight infections and treat wounds .In lithotherapy, silver is believed to maintain a balance between the mind and physical well being. It is thought to strengthen the power of the stones with which it is associated. Silver is also credited with reducing vision problems and with helping to absorb vitamins A and E. On the other hand, no specific virtues are attributed to or know about palladium. 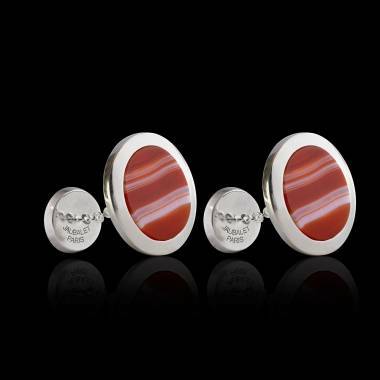 A certain amount of care is necessary to preserve the sparkle of palladium-plated silver jewelry. Use a special jewelry solution or soapy water to clean it. It is important to rinse it well to remove any soap residue and to carefully dry the jewelry piece before wearing or storing it.Since silver tends to tarnish, you can also use your silver cleaner for your cufflinks as you would for silverware. Your jeweler can clean and polish it for you as well.